Royal Mabati ® Durable Mabati Versatile Mart Wrinkle Finish / Traditional Roofing tile Anti-rust and corrosion free. Ksh 650 per meter with absolutely FREE DELIVERY COUNTRYWIDE Within 48 hours. 30 years FADE FREE WARRANTY. A stylish and attractive design product tested and approved by KEBS, produced by a roll forming machine that gives it a traditional roof tile design. Quick and easy to install, it has a high heat resistance, and a long life span due to its perfectly coated high grade aluminum, zinc and steel. Available in : Tile Red, Brick Red, Charcoal Grey and Blue. A brand new construction material which adopts special baking enamel to enrich its color tone and classical flavor for the purpose of your fantastic architectural works. Light in weight, high in strength, water-resistant and easy to install. 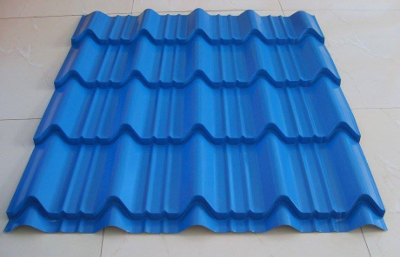 Widely used on villa roofs, city buildings from flat to slope roofs, and buildings in tourism resorts. Integrated the beauty of classical tradition with the outstanding characteristics Of modern high technology. Superior durability, elaborately chosen texture, can maintain original color for a considerable long time. Copyright © 2019 Royal Mabati Factory LTD Reserved.